THE EVOLUTION OF CLASS provide, the wider range of clients they provide services to, and the speed and global outreach they have to provide them with. We are delivering more services to more clients in more places more quickly. The logic of this market change means class has to invest more in powerful IT tools and systems and in a global network if they want to stay relevant. 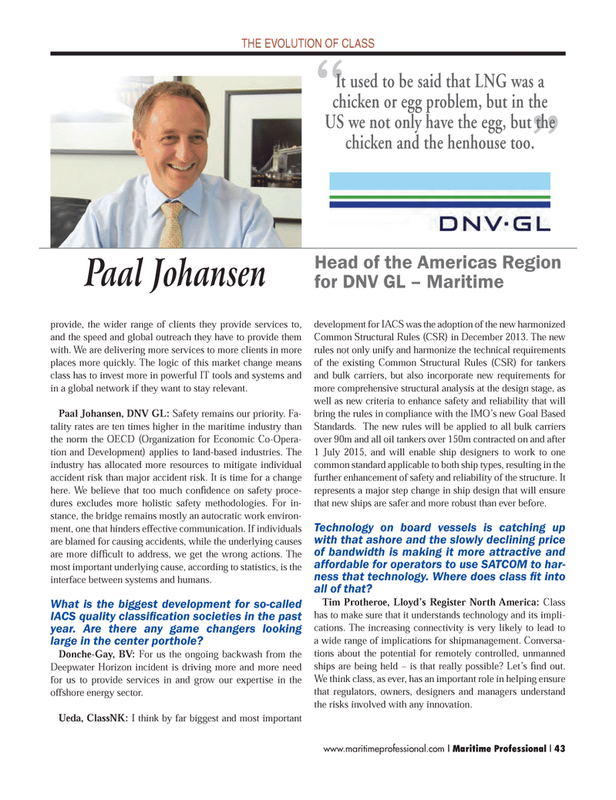 Paal Johansen, DNV GL: Safety remains our priority. Fa- tality rates are ten times higher in the maritime industry than the norm the OECD (Organization for Economic Co-Opera- tion and Development) applies to land-based industries. The industry has allocated more resources to mitigate individual accident risk than major accident risk. It is time for a change here. We believe that too much confi dence on safety proce- dures excludes more holistic safety methodologies. For in- stance, the bridge remains mostly an autocratic work environ- ment, one that hinders effective communication. If individuals are blamed for causing accidents, while the underlying causes are more diffi cult to address, we get the wrong actions. The most important underlying cause, according to statistics, is the interface between systems and humans. IACS quality classifi cation societies in the past year. Are there any game changers looking large in the center porthole? Deepwater Horizon incident is driving more and more need for us to provide services in and grow our expertise in the offshore energy sector. Standards. The new rules will be applied to all bulk carriers over 90m and all oil tankers over 150m contracted on and after 1 July 2015, and will enable ship designers to work to one common standard applicable to both ship types, resulting in the further enhancement of safety and reliability of the structure. It represents a major step change in ship design that will ensure that new ships are safer and more robust than ever before. Technology on board vessels is catching up with that ashore and the slowly declining price of bandwidth is making it more attractive and affordable for operators to use SATCOM to har- ness that technology. Where does class fi t into all of that? Tim Protheroe, Lloyd’s Register North America: Class has to make sure that it understands technology and its impli- cations. The increasing connectivity is very likely to lead to a wide range of implications for shipmanagement. Conversa- tions about the potential for remotely controlled, unmanned ships are being held – is that really possible? Let’s fi nd out. We think class, as ever, has an important role in helping ensure that regulators, owners, designers and managers understand the risks involved with any innovation. US we not only have the egg, but the chicken and the henhouse too.